Ashot Gulian became Minister of Foreign Affairs in 2002. 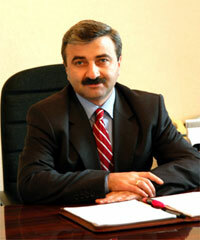 Previously he served as Deputy Minister under Naira Melkumian. Last two years Azerbaijan, Armenia and Nagorno Karabakh held presidential elections. Did anything in the outcome affect the process of peaceful settlement of the Karabakh conflict? It would probably be incorrect to consider the elections in all of these countries as a whole with the purpose of revealing their impact on the settlement process. (But) one cannot absolutely say that a number of internal political events of paramount importance for each of these countries had no certain impact on the Karabakh conflict settlement. On the whole, we can state that society had focused its attention on internal political events, that’s why it was not realistic to expect any stir in the settlement process. I should admit that there was hope the negotiations would go on at full swing under the aegis of the OSCE Minsk group after a new president came to power in Azerbaijan. Unfortunately, we don’t have what we hoped for. Judging by the statements (late last year) of Ilham Aliyev, Baku is not apt to a civil, constructive dialogue. Do you think all the conflict parties are ready to achieve a final settlement of the Karabakh problem? We can speak only on our own behalf. Nagorno Karabakh is naturally interested in the final settlement of the conflict and has showcased its readiness many times. Compared with the other conflict parties, we are in a more vulnerable state. For instance, having a recognized status and, therefore, wider possibilities for rapid development, the other parties enjoy the support of international structures including financial ones. Meanwhile, we have no similar advantages. That’s why we have the ultimate concern in the speedy settlement of the conflict and the final determination of the future of Karabakh. However, I repeat that the statements of the Azerbaijani leadership on different levels obviously testifying to Azerbaijan’s indifference towards civil solution ends any optimism. The new president of Azerbaijan is most likely inclined to go on with the policy of discrediting Karabakh in the opinion of the international structures, intending to shake the international image of NKR as a country adhering to democratic principles and to exclusively peaceful settlement of the conflict. . .
I’d like to emphasize that the further protraction of the conflict settlement is to the benefit of none of the parties and confrontation hinders the full-fledged development of Nagorno Karabakh, Armenia and Azerbaijan, thereby significantly delaying the processes of the region’s integration as a whole. The new leadership of Azerbaijan should not miss the chance to initiate a dialogue with Stepanakert for continuing the process of peaceful settlement in full format. The participation of Karabakh in the negotiations as a full party is indispensable for the final settlement, and Nagorno Karabakh as a relevant unit of the negotiations is ready to make its own impact on the peaceful process, to share the responsibility for both the settlement and the future of the region. Are the people of Nagorno Karabakh ready to accept any decision the authorities may make? The Karabakh people made their decision already in 1991 through internationally accepted procedures, particularly, by expressing their position in a referendum. Twelve years ago, all the people of Karabakh unanimously voted for an independent Nagorno Karabakh Republic, the future of which they certainly see out of Azerbaijan. Ever since that referendum the overall foreign and internal political activities of the Karabakh leadership have proceeded from the people’s major decision. And the republic’s authorities have been trying to actualize the will of the Karabakh people. In other words, it is the Karabakh leadership that accepted the decision of the people and has been strongly adhering to it, striving for international recognition of the independent status of NKR. As for the questions “when” and “how,” it is a different matter; the way leading to independence is not an easy one. However, there is one thing I am certain about – the decision of the Karabakh authorities will in no way conflict with that of the Karabakh people. Are there issues that remain out of the scope of negotiations for you? Since the process of negotiations is currently stuck at a dead-end, and there are no active negotiations as between 1992 and 1997, it is difficult to specify exactly what issues might be left out of the negotiations. If you mean some closed topics that exist for the Karabakh party, then I’d like to say that all the issues for us are subject to discussions in the course of negotiations. There are no closed topics for us, and, as NKR President Arkady Ghukasian noted during his recent meeting with the OSCE Minsk group co-chairs in Stepanakert, Nagorno Karabakh is ready to conduct negotiations with Azerbaijan on any issues without preconditions. The Karabakh leadership has many times expressed readiness to discuss any initiative directed to the peaceful and final settlement of the Karabakh problem. With this, we consider it extremely important to end the propaganda war, which not only fails to assist in finding points of contact but also broadens the gap between both peoples. Do you think it is possible to put an end to the conflict? Yes, of course. I think that the international community on behalf of the co-chairmanship of the OSCE Minsk group is also interested in it. However, I have to state it again that not everything depends on mediators. Very much depends on each of the sides.
. . . I’d like to point out that the political solution of the problem is the ultimate objective of the Karabakh authorities. For many times, the leadership of the republic has emphasized that the negotiation for Karabakh is not an end in itself, rather a means to attain a final settlement. We are utterly concerned about that as we see the future of Nagorno Karabakh in friendly relations with all the neighboring countries and in civil integration with the international community. This is what can really secure worthwhile living and prosperity for the people of Karabakh.